Classic western-style Kid Cardona cartoon (used by permission). Quote from Kid Cardona, 2005; "You don't have to be a great artist to do great things with your art - drawing can open a whole world if you learn how to look in simple ways." What is a Cartoon Caricature? Definition of caricature according to Merriam-Webster Dictionary; "exaggeration by means of often ludicrous distortion of parts or characteristics." What are the elements of a cartoon caricature? Certainly expression, exaggeration, and humor. A more sophisticated caricature has color, perspective, dynamic composition, and sometimes motion. Texas also selects state artists for one-year appointments (selections are made by the Texas Poet Laureate, State Musician and State Artist Committee). Since 1990 appointments are made separately for 2D and 3D artists. See a list of official Texas state artists since 1971. 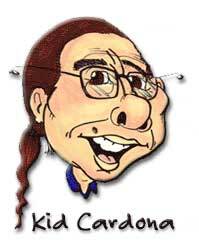 Kid Cardona self-portrait (used by permission). See more of the Kid's work at CartoonPens.com.